Reviewing Terry Laybourne is like writing about the Church of England. It’s easy to take a cheap shot at such an established institution, but at the back of your mind you wonder if it’s actually sacrilege to criticise. Mr Laybourne has undoubtedly done more than anyone to champion good food in our region. He’s brought on new talent, promoted local ingredients, and given us a taste of some really fine cooking. Without him, eating out in Newcastle would be a poorer activity. Yet I haven’t always enthused about everything he does. 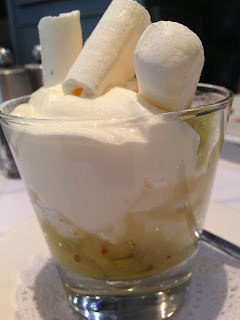 Sure, his Caffé Vivo received five stars and Best Italian of 2011; his Broad Chare pub received four stars and Best Gastropub gong; but his flagship Café 21, named after the original 21 Queen Street, and now renamed just 21, flagged behind with only 3 stars the last time I reviewed it. That was nearly two years ago, since when my review has sat scowling at him on this website like a bad-tempered mother-in-law. Back then, I complained about its smugness, overconfidence and lack of imagination. I criticised a sloppiness of presentation, and unsmiling service. Prompted by a reader who declared it just too good to be ignored, I revisited Café 21 earlier this week. I’m pleased to report a vastly improved experience. It’s still not the most atmospheric of places. When we arrived for a midweek lunch, only six or seven tables were occupied. Curiously, all of these were in a line by the window, so while the rest of the room looked empty and cold, the businessmen seated at the tables could probably hear each other’s private conversations. Mrs Diner and I sat in splendid isolation on the other side of the room. There are big green and grey flowers on the headrests, like something out of a Designer’s Guild catalogue of the eighties. The mood wasn’t helped by rather random canned music. Mrs Diner said she felt like she had been put on hold by a call centre. 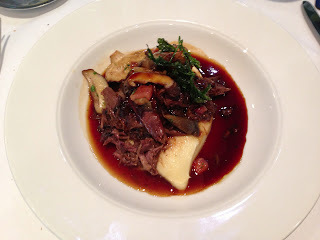 However, when my venison starter arrived, a reassuring warm glow flowed back into the room. It was a delicious, tender ragout, slowly braised with the richest red wine sauce, garnished with wild mushrooms, and under it was a comforting dollop of creamy mascarpone polenta. An uplifting start to any lunchtime. 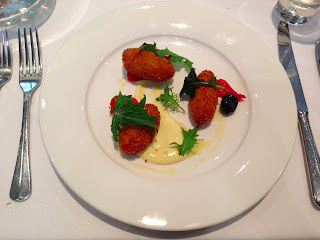 Meanwhile Mrs Diner had croquettes made with strong Iberico ham on some good aioli – these too were delicious. Whether it’s the Mediterranean influence of Caffé Vivo, or some new talent at the helm, the creativity and precision in Café 21’s kitchen has perked up no end. For mains, we ate light: fillet of cod and corn-fed breast of chicken. 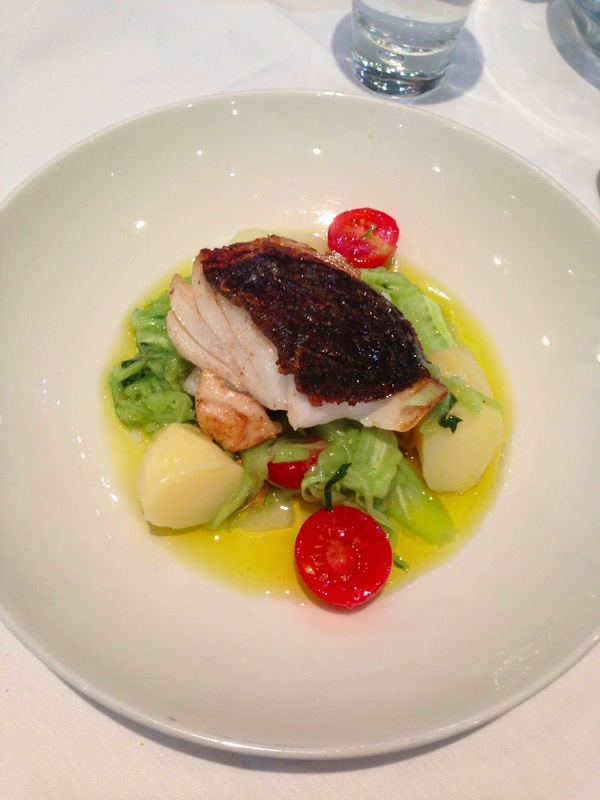 The cod came with a salad of pickled cucumber, which hid a few mussels. The cucumber needed just a little more vinegar to give it substance, but the cod was perfectly cooked, and served with new potatoes. 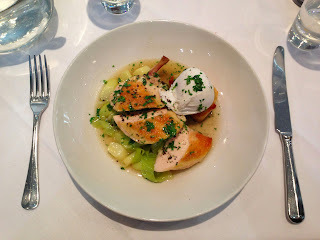 Also perfect was Mrs Diner’s chicken: it was poached and moist, and the scent of grated truffle lingered over a bed of baby leeks within a light broth, crowned with a poached egg on a slice of fried French bread. We ended with dessert: gooseberry and elderflower Eton Mess for me, chocolate and salted caramel tart for Mrs D.
Both were unusually good – elderflower cordial and gooseberries balance each other beautifully, and Mrs Diner’s tart was like something from a childhood dream: smooth but bitter chocolate and inside a rich, flowing caramel. 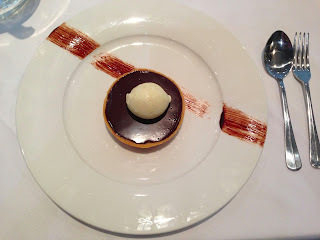 It was like an upmarket Mars bar – or a giant version of those soft chocolate caramels you get in boxes at Christmas. For £20 a head for 3 courses, this was an exceptional meal – no wonder the waiting staff are smiling again. Well done, Mr Laybourne: the institution lives on. Who is the Secret Diner? Secret Stats - who's been peeking!